Hi please check the image attached and help me to understand why the spell checker is underlining parts of two different word for bad words. In text box control, it under line work "coninue" but in spell checker popup it under line half of "coninue" and half of next word. 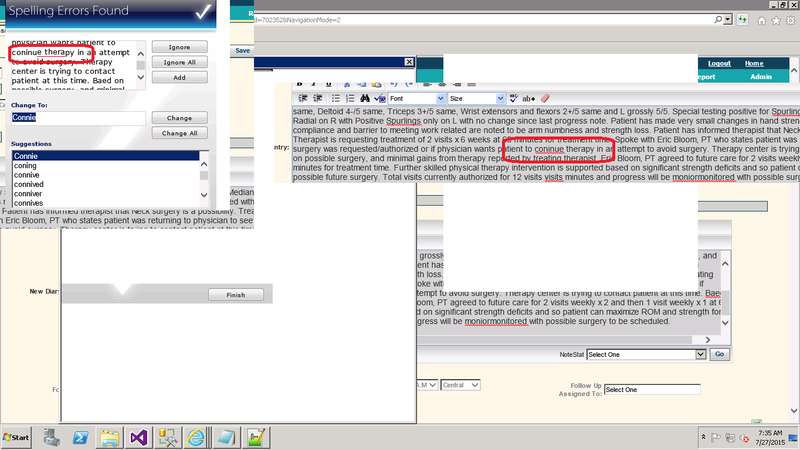 And i can not change or upgrade the Webspellchecker dll with upgraded version. It is not possible to determine what is causing this with your screenshot. I would need some more information in order to better assist you with this. 2. What version of Windows and Internet Explorer are you using? 3. Do any other words in this instance experience this issue such as "Spurlings", "visits", or any other words? It would also help to determine what is causing this if you could provide a simple sample that demonstrates the issue. singh a posted over 3 years ago in reply to [Infragistics] Michael H.
1. it is version 10.3.20103.1013. 2. integrated in an web application. using IE11. window server 2008 R2. 3. it is happening with multiple words.. I am using spell checker with WebHtmlEditor control. version 10.3.20103.1013. I am pasting full string for your check. Patient is a 33 year old Caregiver with Heavy job demands including Sustained Postures and Repetitive Movements currently reported to be on Lost Duty. Patient sustained an injury to her Neck/Cervical Region and R upper extremity on 5/04/15 when she was transferring a client from a wheel chair to bed and heard shoulder pop. DX: Cervical Disc Degeneration, Brachial Neuritis, and Sprain R Shoulder. Patient began this physical therapy on 6/08/15 and was last treated on 7/01/15 with a total of 8 visits completed. Currently patient reported to have high pain at 7/10 with strength and no ROM deficits also reported. Patient does have pain end range of motion. patient is reporting R arm numbness and reflexes on R are diminished compared to L. Progress note AROM from 6/08/15 compared to currently 7/01/15 is as follows: Cervical: Flexion 60d no change, Extension 65d with pain same, R SB 45d with pain same, LSB 50d same, B Rot 45d with pain on L same. Strength testing on R for Cervical spine is as follows: Bicep 3+/5 same, Deltoid 4-/5 same, Triceps 3+/5 same, Wrist extensors and flexors 2+/5 same and L grossly 5/5. Special testing positive for Spurlings, Distraction, Ulnar, Median, and Radial on R with Positive Spurlings only on L with no change since last progress note. Patient has made very small changes in hand strength. No issues are noted with compliance and barrier to meeting work related are noted to be arm numbness and strength loss. Patient has informed therapist that Neck surgery is a possibility. Treating Therapist is requesting treatment of 2 visits x 6 weeks at 60 minutes for treatment time. Spoke with Eric Bloom, PT who states patient was returning to physician to see if surgery was requested/authorized or if physician wants patient to coninue therapy in an attempt to avoid surgery. Therapy center is trying to contact patient at this time. Baed on possible surgery, and minimal gains from therapy reported by treating therapist, Eric Bloom, PT agreed to future care for 2 visits weekly x 2 and then 1 visit weekly x 1 at 60 minutes for treatment time. Further skilled physical therapy intervention is supported based on significant strength deficits and so patient can maximize ROM and strength for possible future surgery. Total visits currently authorized for 12 visits visits minutes and progress will be moniormonitored with possible surgery to be scheduled. Thank you for the information. After some testing, this is related to an old issue involving plus signs (+). Each time a plus is encountered while parsing, the underline is offset by two places. I've tried to apply the bugfix in a workaround and have not been successful. You will need to upgrade in order to resolve this. The fix is available in the latest Service Release for 10.3 (10.3.20103.2217).